Adding salt to beer doesn’t, at first, seem like the most natural thing to do. Indeed, thinking about it a second time still doesn’t make it seem the most natural thing to do. Yet it’s been done for a long time – at least, it has if you’ve been swanning around the ancient town of Goslar in Germany where salty beer is, thanks to the water supply, something of a peculiar specialty. It goes by the name Gose and it’s a style that’s undergone something of a renaissance in the modern beer world. 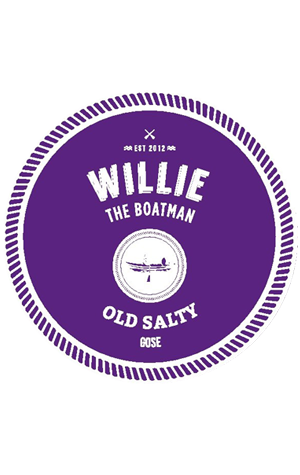 Willie The Boatman was one of the early local adopters in Australia with its Old Salty being one of the first beers to ever come from the original brewery (a particularly memorable drop owing to it being made to pair with a green apple flavoured marshmallow). They went through a few incarnations of the beer over the years before settling on a version brewed with the addition of rockmelon. It doesn’t come across as an outright sour beer, though it is very clean and crisp so the overall feeling is of refreshment – especially with the salty character helping dry out the finish.The melon character is undeniably present in its tropical splendour yet it’s still relatively restrained overall, the fruitiness sitting alongside the rest of the flavours rather than trying to roll right over the top of anything. There’s even a subtle hint of coriander added to the mix too. There’s no doubt that Old Salty is an unusual beer so its worth taking take two sips, maybe three, before passing final judgement. You might be one of the many over the years to discover that Old Salty presents a pleasant surprise.